Mario Brisson is a 26-year-old false prophet with a popular YouTube channel titled, “The Vigilant Christian.” I think he is sincere, as Cornelius in Acts chapter 10, who was religious but lost. Unfortunately Mr. Brisson ruins his hard work by espousing a false plan of salvation, in particular, by promoting Evangelist Paul Washer's Lordship Salvation garbage! If a man is wrong on repentance and salvation, then he is going to be wrong on everything. It's like buttoning a dress shirt, that is, if you get the first button wrong, then all the buttons are going to be wrong. There is no subject as important as salvation, and Mario Brisson and Paul Washer get it VERY WRONG!!! Brisson's video is titled, “Shocking Youth Message - Paul Washer - The Gate is Narrow & Few Find it!.” In this presentation he shows a short clip from one of Paul Washer's sermons, “Shocking Youth Message.” It's shocking alright, and a false plan of salvation. Mr. Washer's preaching may sound noble, serious and Christ-honoring, but there is poison in his message. I'll focus more on Washer's false teachings in a moment. Brisson also mentions Pastor David Wilkerson, another teacher of Lordship Salvation. Do you see how subtle and satanic the preceding quote is? I've heard umpteen preachers pervert the true meaning of Matthew 7:21-23, saying that Jesus doesn't know those professed believers who still live in willful sin. That's not what the Lord taught. The Bible simply means that you cannot get to Heaven by works. These religious false prophets boldly said in Matthew 7:22... We have, “IN THY NAME DONE MANY WONDERFUL WORKS.” This is why they were not saved. They failed to do the Father's will which is plainly stated in John 6:40, “And this is the will of him that sent me, that every one which seeth the Son, and believeth on him, may have everlasting life: and I will raise him up at the last day.” If you believe on the name of Jesus, Who died on the cross for your sins and rose, you are saved. It's that simple to be saved, so simple in fact, that most men pass right over it in favor of a false plan of salvation that requires some degree of human effort. My friend, completely rest in Jesus Christ to be saved (Hebrews 4:10-11). Mario Brisson makes the foolish mistake of getting his theology from today's false prophets. The Word of God simply teaches that Jesus is the Christ Who died on the cross in our place, to pay for our sins. He was buried and bodily rose up from the dead three days later. This is the Gospel according to 1st Corinthians 15:1-4. If you realize that you are a guilty sinner in the eyes of a holy God, and you believe that Jesus died on the cross for your sins and rose, you are saved (1st Thessalonians 4:14). Please read, Repent And Believe. There is nothing wrong with calling today's youth to follow Jesus, pursuing holiness and righteousness, instead of shallow “Cultural Christianity” as Paul Washer calls it; however, it becomes wickedness when you corrupt the simplicity of salvation. There is no argument that our churches are filled with false conversions these days, but it is not because people refuse to forsake sin; but rather, because preachers are corrupting the Gospel and don't preach the truth anymore. People have been errantly taught to “Ask Jesus into your heart” or “Make a commitment to Christ” or “Surrender your life to Christ” to be saved, but these are not the Gospel. Please read the excellent sermon, “What Is The Gospel?” by Dr. Harry Ironside. Ironically, it is the very teaching of Lordship Salvation that is hindering people from coming to Christ to be saved. It provides men with a false hope, so they stop looking for answers, and then they go to Hell. They will plead to Jesus Christ on Judgment Day, “Lord, Lord...” (there's your Lordship Salvation)... yada, yada, yada! Then Jesus will say the horrifying words to them, “Depart from me ye cursed, for I never knew you!” Please read the awesome book, “I NEVER KNEW YOU” (.pdf) by Michael P. Bowen. Eternal life is a free gift. A gift is taken, not merited. I'm tired of false prophets telling us that eternal life is completely free, but it is hard to obtain and you must forsake the world, cease from sinful bad habits, follow Jesus and surrender all to Christ to actually receive it. The truth is that all these Lordship Salvation preachers are deceived and being deceived by the Devil. They've got works on the brain and cannot break free of it's influence on their theology. I recently visited an Independent Fundamental Baptist church where John MacArthur is praised as the world praises Elvis Presley. The pastor said in his invitation that it's not enough to admit that you are a sinner, but he said, you must also forsake a sinful lifestyle to be saved. I doubt if that pastor is saved. How can he be? I mean, if he thinks that holy living is necessary to be saved, then he is trusting in his own personal behavior. That Baptist pastor is deceived, having the mindset that salvation is by faith alone, while in reality he has added human effort to partial faith in Christ. This is the forked-tongue, double-talk, that all the satanic religious cults use (like Jehovah's Witnesses and Seventh Day Adventists), because the easiest place to hide a lie is between two truths, and Satan fully knows it! The problem is that Mario Brisson and Paul Washer corrupt the simplicity of the Gospel, by adding the human effort of a changed life to be saved. This is NOT the Gospel. According to these false prophets, you are not really saved if there is no accompanying thirst for holiness and righteousness. They subtly begin their false plan of salvation as the Jehovah's Witnesses and other pseudo-Christian cults do, by saying that eternal life is a free gift that cannot be earned (so far so good), but THEN they corrupt the plan of salvation by adding the lie that you're not really saved unless you live a holy and godly life. They're confusing discipleship with sonship. They're mixing the crucified life with the saved life. For an excellent MP3 sermon on the subject, please listen to “Steps To Sanctification (Or The Root Of All Heresy)” by Dr. Jack Hyles. Also, something that I don't like is that “The Vigilant Christian” has a PayPal account linked to his YouTube ministry so people can send him money. What a joke! That is a major warning flag. Mario claims the money is for materials... for a YouTube channel? It is sad that money seems to be the common denominator in today's apostate so-called “ministries.” It will be a cold day in Hell before I ever ask, receive or let anyone give me money for serving God. My reward is in Heaven. I want people to know where my heart is at. I do what I do for the Lord, to help others in Christ. I don't criticize pastors and legitimate Christian organizations for selling materials, but I have a problem with a YouTube Channel asking for money. 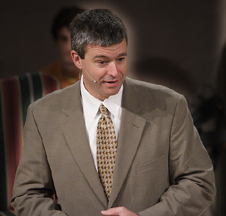 Paul Washer is a heretic!!! The thief on the cross prayed a little prayer. The publican who went up to the temple to pray simply said a little prayer. It wasn't the prayer that saved them, but their faith in Jesus Christ. God saves the vilest sinner who cries out even with the faintest and smallest of prayers, believing that Jesus is the Christ, the Son of God (John 20:31). Ray Comfort attacks soul-winners for practicing what he calls, “quick-Fix” evangelism. They despise the idea of showing a person some Scriptures from the Bible and then leading them in a sinner's prayer to be saved. Paul Washer calls such preachers of the Gospel, “STUPID EVANGELISTS.” Isn't that terrible? Paul Washer should be ashamed of himself. If the Bible teaches anything, it teaches that the Gospel is simple, and it's very easy to be saved. You simply come as a SINNER and you believe upon the GOSPEL. It's that simple! Granted, some people do pray a prayer and never get saved. Catholics do it all the time, praying vain repetitions (Matthew 6:7). Albeit, I'm not going to corrupt the simplicity that is in Christ by perverting the Gospel into ANOTHER GOSPEL. God's plan to save sinners is for men to acknowledge their sinnership and believe on the Savior, Who died on the cross for our sins, was buried, and rose again three days later (1st Corinthians 15:1-4). That is the Gospel. That's it! Salvation is not a prayer. We are saved by our heart's faith in Jesus as the Christ, the only begotten Son of God (Romans 10:9-10). Thus, it is very appropriate to pray a sinner's prayer if it is to express one's trust in the Lord for salvation. The sinner's prayer comes from Luke 18:13, “And the publican, standing afar off, would not lift up so much as his eyes unto heaven, but smote upon his breast, saying, God be merciful to me a sinner.” The thief on the cross prayed. If you listen to Paul Washer's Sermonette, he says it sometimes takes weeks and months to get people saved, alleging it is hard to believe. Washer uses this argument to shun the idea that a person can be saved by praying a quick prayer, aka, the 1-2-3 follow me method. Like it or not, salvation is simple, call it what they will. Lordship Salvation is Calvinism's teaching of the Perseverance of the Saints. It is a false gospel. John MacArthur is admittedly a 5-point Calvinist. The saddest thing of all is that I know pastors who foolishly refer to John MacArthur as a “great man of God,” when in reality MacArthur is a false prophet who is steeped in satanic Calvinism. Stop and think about the thief on the cross who in a moment's time simply admitted his sinfulness and cried out to the Lord to be saved. It was a simple prayer. Shame on Paul Washer, Ray Comfort, Kirk Cameron and John MacArthur who MAKE SALVATION HARD!!! It appears that Paul Washer doesn't really believe in being born-again in a Biblical sense from the way he talks. Being born-again is an event in one's life, happening in a specific time and a place. What in the world is so wrong about writing that time and place down in your Bible? Paul Washer is bad news. Clearly, Washer believes that salvation is a process, similar to what Seven Day Adventists teach, where a person is never really guaranteed salvation, pending how they choose to live their life. God has PROMISED to save those who believe; thus, it is certainly appropriate to write down the time and date when one receives Christ and is born-again. Paul Washer is wrong to criticize such a thing. I was saved as a young teenager. I remember the place. I remember the sermon. I remember the conviction of the Holy Spirit for the first time in my life. I remember trusting Jesus in my heart to be saved from my sins, believing that He died for my sins on the cross and rose; but I don't remember the date or even the year. I didn't think to. It would have been nice to know when I was saved. No one personally led me to the Lord, I was saved in a pew under the preaching of the Word of God. My pastor said that if you don't have the Holy Spirit convicting you of sin, you're not saved. I knew right there and then that I wasn't saved, but I wanted to be, immediately. And so I believed on the Lord that day to save me. I'm pretty sure I was 13, but am not exactly sure. Albeit, I don't worry about that because I know I am saved today. There is an ever real faith in my heart in the Lord Jesus Christ, Who is the Son of God that died for my sins upon the cross, and was buried and rose again. Salvation is not dependent upon some past experience or memory, but upon whether we believe or not in our heart now. I know where I was saved, and the circumstances, but I don't know when (and that's ok). Amen! I know I am saved now. So I can understand the blessing of telling a person to write down the date and time that they receive Christ (John 1:12). The Devil certainly does attack many people, filling their minds with doubts and fears. I feared for 7 years after I was saved, fear that I wasn't really saved. Did I have enough faith? Did I miss something? Salvation is a decision on our part, but a supernatural miracle of God on His part. Everyone will ultimately decide to either receive or reject Jesus Christ. I have received Him and He is my precious God and Savior. Paul Washer's problem is that he confuses discipleship with sonship, and in so doing he negates the PROMISE and GIFT of God. If you offer me a gift, I can just take it (if it's truly a gift). I can write down the date and time. There are no stipulations nor obligations to live a certain way or behave myself. A gift may simply be taken freely. Like it or not, salvation happens instantaneously the very moment that a person trusts Jesus Christ to be saved. Christ died, that's history; Christ died for me, that's salvation! It's not what you're doing that gets you to heaven, it's where you're looking. LOOK TO JESUS! Is Romans 10:13 Stupid Mr. Washer? "all these stupid evangelists walking around telling men after they've made some little prayer that they need to write their name in the back of their Bible, and put the date and if the Devil ever comes to them, they need to show him that." Titus 1:2, “In hope of eternal life, which God, that cannot lie, promised before the world began.” Eternal life is a PROMISE, which means we can have full confidence that salvation is ours UNCONDITIONALLY IN CHRIST JESUS (Romans 8:1). However, according to Calvinist teachings (that Lordship Salvation is rooted in) a person is not safe just because Jesus died. Calvinists teach that a person must CONTINUE in obedience and faith or they never had salvation to begin with. So in fact, good works are REQUIRED as evidence of salvation, and a person is said not to be saved who doesn't have WORKS. How in the world can anyone claim this is not works salvation??? John Calvin (1509-1564) was a scumbag heretic, an unsaved reprobate, a brutal tyrant, and a sick-minded freak. Calvin was a member of the occult, demonstrated in the hand-sign given in the painting to the right. Calvin taught Baptismal Regeneration and sacraments, just like the heretic Martin Luther (loser). It's hard to comprehend why people follow the erroneous false teachings of flawed men who've been dead for centuries. I mean, Calvin's been dead for 447 years now. I mean, I like to read classic sermons by Charles Spurgeon, George Whitefield and Jonathan Edwards; but I don't get my doctrine from anybody except THE BIBLE. 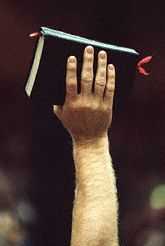 The Bible is our Authority!!! The Bible teaches the PRESERVATION of the saints, not the PERSEVERANCE of the saints! Mr. Comfort is a Calvinist, who believes that if you don't PERSEVERE in obedience, works and faith, then you cannot get to Heaven. I recommend to anyone who agrees with ray Comfort, Paul Washer and John MacArthur to go back and research the beliefs of John Calvin. I read in some Baptist message board online where a member said God uses different methods to reach different people. The person was trying to defend the Lordship Salvation crowd. That is simply not what the Bible teaches. There is only ONE WAY, and that is God's way in the holy Scriptures. Paul Washer and Ray Comfort's method of evangelism is based on Calvinism's teaching of the perseverance of the saints. That is, true saints will persevere in good works and holy living and those who don't are not saved. It is a heretical doctrine of devils. The Bible teaches the PRESERVATION of the saints, not the PERSEVERANCE of the saints! If you understand John Calvin's heresies, then you know why Paul Washer is corrupt and teaches the garbage that he does. I've noticed that Paul Washer's ministry is deliberately uploading dozens and dozens of videos pushing Lordship Salvation. Bible-believing Christians need to counter all this by making their own videos. YouTube is a weapon for good and evil, depending on who's uploading videos and whether they're on God's side or the Devil's. Join the fight! (Ephesians 6:12). Spurgeon believed in a free-grace gospel, nothing more. A sinner is saved by God's grace through faith (Ephesians 2:8-9). Harry A. Ironside correctly recognized repentance as the confession that "one is utterly without merit" and that if one is "ever saved at all it can only be through the merits of our Lord Jesus Christ." Salvation is without works of self-righteousness. Romans 4:5 plainly teaches that a man's faith is COUNTED for righteousness, i.e., the righteousness of Jesus Christ is imputed to one's heavenly record by faith. Don't mess with the Gospel. Just believe it! "For there are many unruly and vain talkers and deceivers... Whose mouths must be stopped, who subvert whole houses, teaching things which they ought not, for filthy lucre's sake" (Titus 1:10). Heretics such as Paul Washer must be exposed. Satan is a master deceiver. It is what he does best. 2nd Corinthians 11:13-14 warns that Satan's ministers will come to us disguised as minister's of righteousness. Yet, sadly, the average person today is woefully ignorant of the Scriptures and cannot readily identify a false prophet. It's no secret how to spot a false prophet. The key is to SEARCH THE SCRIPTURES as Jesus commanded in John 5:39. This is so important. The Word of God is the believers Lamp, Sword and Final Authority. One of the clearest evidences that a person is saved is their love for the Scriptures. The unsaved world hates the Bible because It condemns them (John 3:20). So if you want to be able to identify a false prophet, then learn what the Bibles teaches and measure everything else by It. Where does Christ's imputed righteousness come into play in Paul Washer's false gospel? Is not salvation a "free gift"? Yes, it is! One of the most abandoned, forgotten and ignored doctrines of the Christian faith today is the subject of IMPUTATION. Romans 4:6 states, "Even as David also describeth the blessedness of the man, unto whom God imputeth righteousness without works." Did you read that Mr. Washer... God imputeth righteousness WITHOUT WORKS! The word "imputeth" here is the Greek word logizomai and means "to pass to one's account." Literally, in response to our trusting upon the Lord Jesus to forgive our sins, God places Christ's righteousness upon our record in Heaven, and our sins were placed upon Jesus upon the cross... "For he [God the Father] hath made him [God the Son] to be sin for us, who knew no sin; that we might be made the righteousness of God in him" (2nd Corinthians 5:21). Paul Washer is lying when he says that a person must "continue on" to validate their salvation in the eyes of God. No Sir, that is a lie of the Devil. Jesus paid a debt that He did not owe, because we owed a debt that we could not pay. One's salvation, if it is genuine, is based entirely upon the finished redemptive work of Christ, when He applied His physical blood to the Mercy Seat in Heaven (Hebrews 9:12). We are saved solely by the blood of Jesus that washes our sins away (1st John 1:7; Revelation 1:5). The King James Bible mentions the words impute, imputeth, imputing and imputed 15-times. Tragically, the New International Version (NIV) of the Bible entirely removes the word "impute" in every form. No wonder the doctrine of imputation has disappeared in our churches and the hellish heresy of Lordship Salvation has saturated America's churches. Lordship Salvation is a disease, a plague, an epidemic from the pits of Hell that IGNORES the imputed righteousness of Jesus Christ. The New International Version is a piece of vile garbage and if you have one, destroy it please! "The evidence that you are truly converted today is that you will continue on. If only most of the Americans had been told that, they would not be resting in false security today." Washer is tricky in his words. Although he speaks of "evidences" of salvation, he also plainly makes it clear that those "evidences" are a requirement for salvation. In effect, Washer has combined the FRUIT of a believer's faith (James 2:18-21) with the ROOT of a believer's faith (Romans 4:5). To do so is damnable heresy and a guaranteed road to Hell. The doctrines of Lordship Salvation and the Perseverance of the Saints are foreign to the Gospel of Jesus Christ. Both doctrines are rooted in works salvation. Paul Washer is clearly a follower of John Calvin, who errantly taught that a believer will continue in faith and repentance as part of salvation. Such notions completely abandon the imputed righteousness of Jesus Christ which is WITHOUT WORKS... "But to him that worketh not, but believeth on him that justifieth the ungodly, his faith is counted for righteousness." Amen! How can anyone argue with Romans 4:5? ... HIS FAITH IS COUNTED FOR RIGHTEOUS!!! There is nothing mentioned here about "continuing on" in faith and repentance as Washer foolishly teaches. There is NO controversy if you believe the Bible. Salvation is without works and "continuing on" in anything is a work of self-righteousness! Again, a changed life is the FRUIT of genuine repentance and not a part of saving-faith. But let's say that a person comes forward or a person is out there with us in a park somewhere and they say, "Yes, I believe, I believe he saved me today." You should say, "Praise God!" But then, then, you should say, "Now listen to me very clearly. If you have indeed repented of your sins and believed, God has saved you; but the evidence that you have truly repented and believed unto salvation is that you will continue repenting and believing..."
If you tell this to someone, you have perverted the Gospel. Washer is clearly teaching that for one's salvation to be valid, they must put forth the effort to “continue repenting and believing.” This is not Biblical. Salvation is a gift. If I were to give you a gift, but then require you to continue doing something as a condition of receiving it, then it certainly wouldn't be a gift. To get to Heaven, we need HIS RIGHTEOUSNESS... “But seek ye first the kingdom of God, and his righteousness; and all these things shall be added unto you” (Matthew 6:33). Paul Washer wrongly requires sinners to put forth their own righteousness, i.e., to continue repenting, to be saved. Paul Washer believes that a person is saved by grace through faith, but if works don't follow then they never got saved to begin with (so in effect, works are being mandated for salvation). These men are evil, trying to do the job of the Holy Spirit. When you get saved, the Holy Spirit comes to live in your body, but you DON'T CHANGE ONE BIT. Old habits are still there. Ignorance of spiritual things is still there. Fleshly lusts and sinful tendencies are all still there. A new convert must be mentored to grow in grace (Matthew 28:19-20), desiring the sincere milk of the Word to grow thereby (1st Peter 2:2). If one understands the imputed righteousness of Jesus Christ to the believer's record (Romans 4:5-6), made possible only through His precious applied blood in Heaven (1st Peter 1:18-19; Hebrews 9:12-24), then imposters like Paul Washer and Ray Comfort are quickly exposed as false prophets. In Calvinism and Lordship Salvation, which teach the heresy of the Perseverance of the Saints, that is, if a person is truly saved they will persevere, the burden is heavy upon the sinner. Bless God, I believe in the PRESERVATION of the saints, not the perseverance of the saints!!! Paul Washer even says to go tell new converts that if they don't work hard at living holy, surrendering to Christ, and fearing God, that they'll go to Hell because it shows they never got saved. Paul Washer is teaching demonic doctrines!!! To tell a person that God saved them by grace, but now you had better go live right or you didn't really trust Jesus and are going to hell... That's INSANE!!! Anytime some preacher places the burden and responsibility of salvation upon men's shoulders, by requiring a changed life as being necessary to seal our salvation, you can be assured they are of the Devil. Jesus paid it all. Beware of Mario Brisson's and Paul Washer's false plan of salvation! But you say, Mario Brisson, Ray Comfort, David Wilkerson, Paul Washer, Chip Ingram, Kirk Cameron, Billy Graham and John MacArthur are sincere and their heart is in the right place, doesn't that mean they are still saved, just confused? May I remind you that the false prophets in Matthew 7:21-23 where totally sincere, but Jesus had them cast into the Lake of Fire as reprobates. There's a fine line between Biblical salvation and religion, but it is the line between life and death; one plan of salvation leads to the new birth in Christ, but the other leads to a life of religious devotion, moral cleanliness and commitment to a Christ they don't know. You'd better get born-again! Why Criticize Ray Comfort and Kirk Cameron?